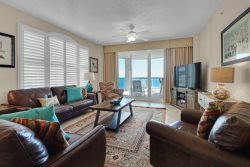 We would like to welcome to the market Pensacola Beach's newest luxury home! This is a 5BR/5BA private home with private pool in an excellent location. This is at 307 Maldonado which is a 1/2 block to the beach, about 50 steps along a residential sidewalk. The house is a luxury home, with a top end appliance package. All stainless steel Kitchenaid with extra Fridge in laundry room and a Beverage Center as well. The house will have everything you would expect from a brand new beach vacation rental, plus elevator, private pool, and designer decor. The bedroom layout will consists of 3 bedrooms with king beds, and two of those rooms will have a twin sleeper/chair combo. The 4th bedroom will have two queen beds. The 5th bedroom will be a bunk room with 6 beds, three full beds and three XL twin beds - laid in out into two separate stacks of 3. All bedrooms will have on suite full bathrooms. The house will be completed at the end of May 2018 but we are starting reservations for the July 4th week so we can have it prepared properly. This house is an excellent addition to our already outstanding Portfolio of large beach homes presented by Gulf Coast Getaways.